PLAYISM, in partnership with Vaka Inc. and Crunchyroll is proud to present the very first ever Japanese game-based franchise Bundle on Steam. Angels of Death will be celebrating its arrival by deeply discounting the game and the Bundle this week! 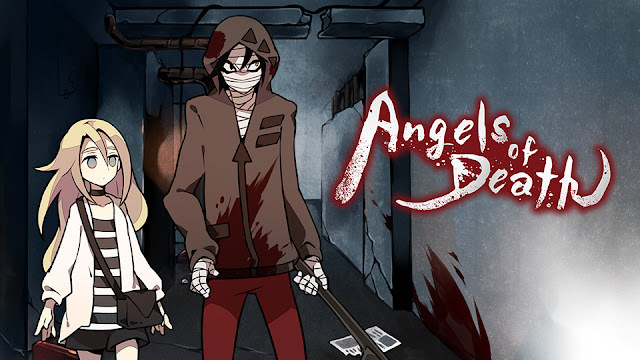 The hit title; Angels of Death, is a psycho horror adventure game consisting of four parts developed by Makoto Sanada, known as the creator of the explorative horror game Forest of Drizzling Rain made in RPG Maker. After the success of Angels of Death, as a game and a manga series, the franchise made its anime debut in the summer 2018 to critical acclaim and is distributed on the Crunchyroll platform. The two formed a peculiar bond through their strange "promise" and started to search for an exit to the sealed building together. What kind of hell have they found themselves in? For what purpose are they imprisoned? What does fate have in store for them? After having successfully brought the puzzling horror adventure game, Angels of Death to paper in the form of manga, we are very proud to introduce this new anime that will allow players to see the story in a whole new and vibrant perspective thanks to the experienced team at J.C.Staff, songs from Masaaki Endoh and Haruka Chisuga, and great performance by talented voice actors. We believe there are many anime fans on Steam so it is very exciting for us to be releasing this Japanese game-based franchise bundle, the very first on the platform with a sale that, we hope, will encourage a large number of people to make their first step into the Angels of Death universe. Angels of Death GAME: made of 4 episodes, each containing an entertaining and dark story. Angels of Death ANIME: 16 episodes based on the game giving a new perspective on the thrilling story. Languages: English, Japanese, Korean, Chinese (Simplified, Traditional). Subtitles: English, Spanish, French, Portuguese, Arabic, Italian, Russian.